Not always wild, not always fiction. 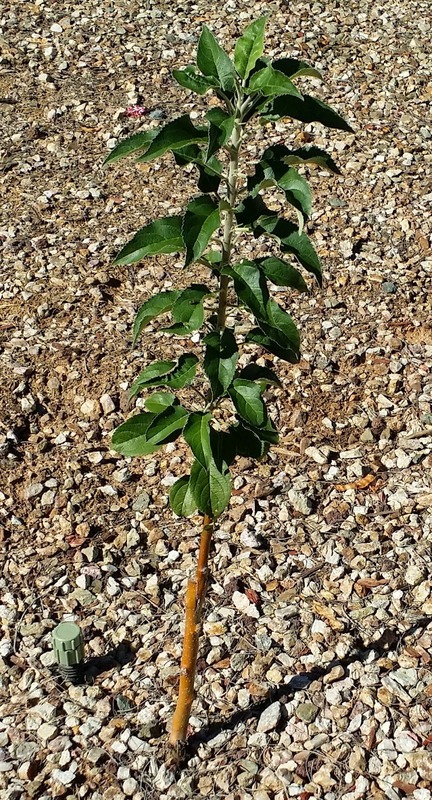 Last Saturday (25 January 2014) I attended a grafting "class" at Arizona Rare Fruit Growers and grafted my first tree. My father-in-law was with me and he grafted the one on the left. That one is an Arkansas Black. 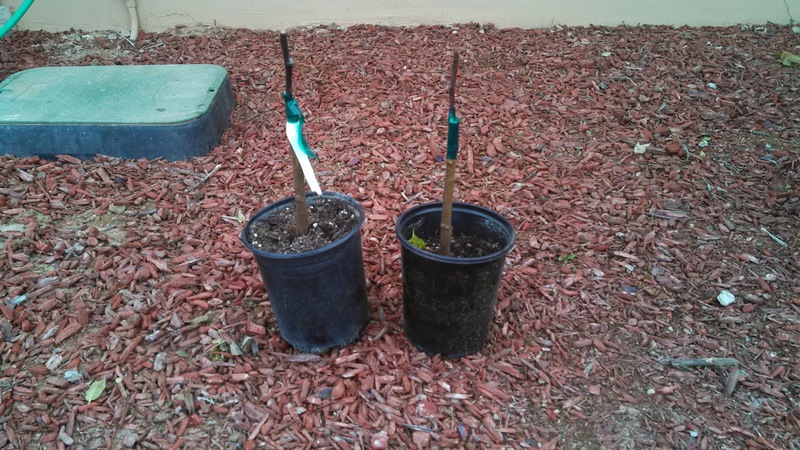 I grafted the one on the right which is a Grimes Golden. The AZ fruit growers association had been on an excursion to a place east of Phoenix just west of Miami called Top of the World where there are a bunch of apple orchards which were originally grown to feed the miners during the boom days. They took a bunch of scions from there and these are two of them. Congratulations! Your new apple tree is happy to have a home. Take care of it and it will live to be 50 or 100 years old! You have a grafted apple tree, grafted to a root that is a “semi-dwarf” rootstock. Your tree will never grow to be 30 or 40 feet tall. This is good news! You can easily keep this tree at 8 or 10 or 12 feet tall! No worries! Remove the green or white tape by June 1 this year. Remove all new growth and shoots from below the graft location after you are sure your scion is growing and well connected. Then, do not let any shoots grow from the rootstock. Remove all but the strongest bud growing from the top (scion) and then tie this shoot to a stake. It will become your tree trunk! Plant the tree in a sunny location, the more morning sun, the better. A well drained location is best. You may even wish to plant it on a mound. Water it often when the weather is warm this first summer. If you cannot plant it in your yard by June 1 this year, you must move it to a 5 gallon container on June 1 or it will quickly become "pot bound" in that gallon can! Fertilize this young tree with care. Some of our CRFG members water their tree with "Miracle Grow" at half strength, every time they water during the spring and early summer! It will go dormant as winter approaches and all of the leaves will fall. This first winter, you may prune the top of the tree off. Yes, cut that single shoot so it is only 18 to 24 inches tall. This will force the side buds to shoot out in the next spring and begin to build the main scaffold/framework for a nice tree. Most back yard apple trees are destined to be in the shape of a vase… with 3 to 5 main branches coming from the single trunk. Do not let your tree have more than 5 main branches at this point. If you planted your apple against a wall, you may wish to train the tree to be flat, more of a fan shape or even "espalier" the tree! The good news is that apples respond to training. They will quickly adapt to any shape you wish or need. We want the tree to work hard on building a strong foundation for the future in these early years so, we only let the tree have one or two apples the second year. Remember, it takes 55 leaves to make enough sugar to have that big apple taste just right! So, thin the apples to leave only the biggest one the second year. Finally, if your main scaffold branches try to grow straight to the sky, you may want to pull them down gently, and over time, have these branches grow at more of an angle, even horizontal for the first few feet! This is the Grimes Delicious, the one that my father-in-law grafted. The one that I grafted did not take so there is not Arkansas Black. The Grimes Delicious is doing well and I've been following the instructions to cut away all but the strongest bud and soon I'll lop off the top to make it grown like a vase. If you haven't seen Jean Claude Van Damme's (JCVD) Volvo advert then I suggest you take a look at it. And in case you were thinking of trying that note the warning at the end of the video that points out that this was done by professionals on a closed circuit. Now take a look at Chuck Norris' response. Note that Chuck's stunt does not carry any warnings about professionals or a closed circuit so feel free to try this one at home. I guess this stunt was easier because they were going forward unlike the JCVD stunt which was going backwards.